A Match Made in Heaven (Plus a Great Special Offer)! 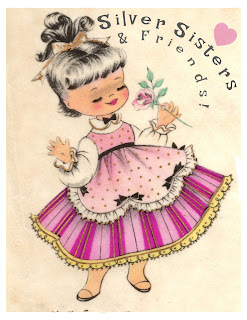 Happy (early) Valentines Day my wonderful friends, family and Silver Sisters!!! In celebration of this lovey-dovey holiday, we've teamed up with another wonderful hair care line to bring everyone AN EXCITING OFFER!!! 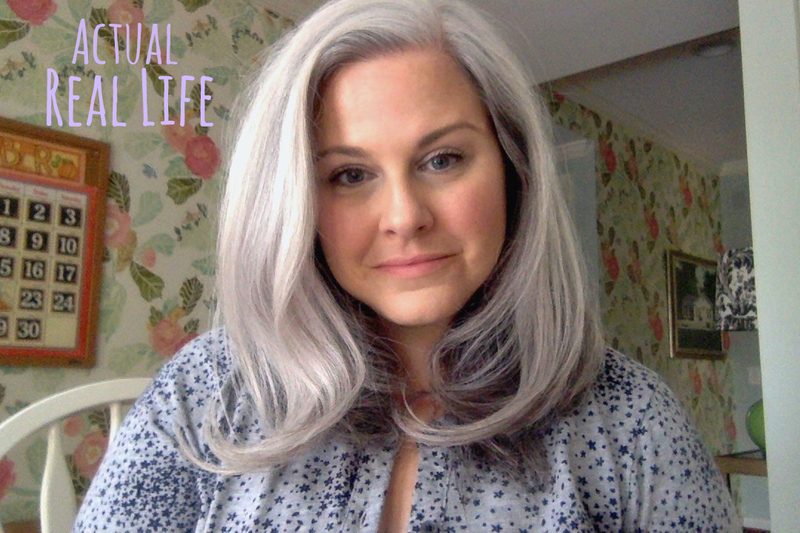 Friends, I'd like you to meet: QuickSilverHair! QuickSilver is the fantastic, one of-a-kind creation of Joli Campbell. 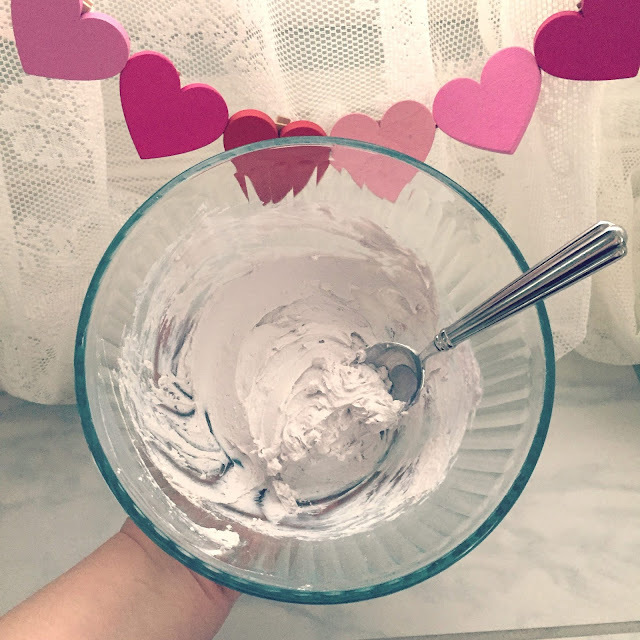 Joli, a fellow silver sister and curly girl (you can read her interesting story HERE), set out to craft for the silver community a chemical-free and cruelty-free hair mask and hair oil to help us whiten and brighten and shine! Her hair mask system for brightening is so unique that there's nothing like it available to us, and I was thrilled when Joli approached me and asked if I wanted to try QuickSilverHair. I said: "YES, I would love to!" almost before she could even get the words out. It was really exciting, as I've been eyeing her line for quite some time. We decided to do a product swap - Joli tried some of our BY THE WAY, Your Hair Looks Fabulous!™, and I spent a month using QuickSilverHair. This post is about my experience using QuickSilver. 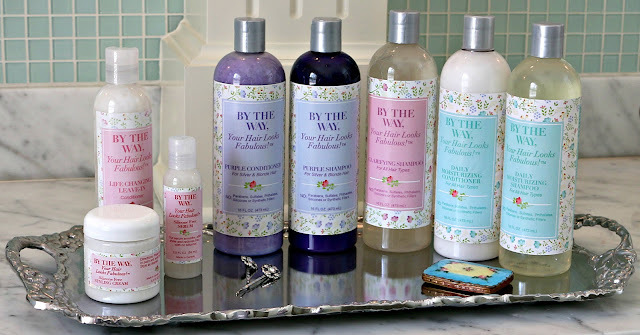 It was such a nice nice way to pamper and care for my hair, and something that you might be curious about giving a shot too! You end up with lusciously soft hair, but also have a great, relaxing time! In the process of swapping, we realized that our products compliment each other very well, which I will explain a bit more in-depth later. This is what lead to such a nice idea from Joli - that we offer all of our readers a joint Valentine's Day coupon to QuickSilverHair and The By The Way Company! 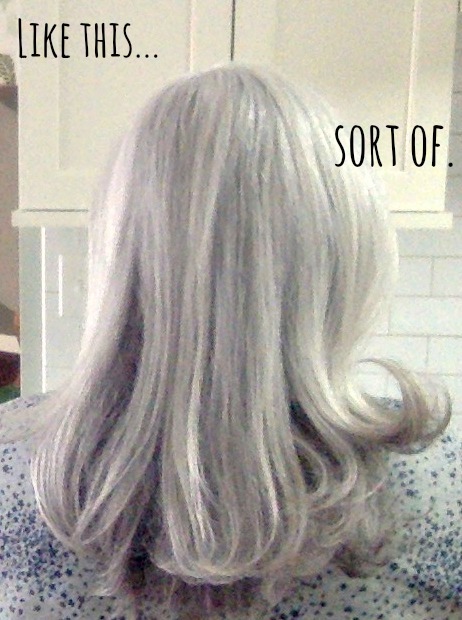 First, let's start with all of the fun that I had while using QuickSilver's hair mask and oil and my results. 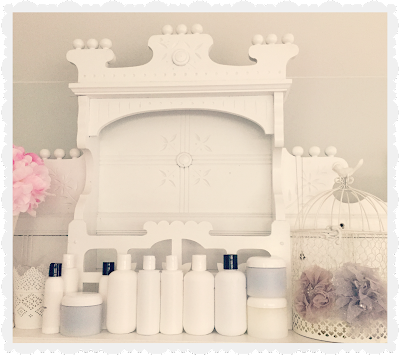 Meant to brighten and soften your tresses, the wonderfully hydrating hair mask is made of pure Kaolin white clay. The only other ingredients are organic cornstarch and natural essential oils, so it's extra gentle. I've noticed that the 5 oz. tin of clay and the 50ml. bottle of hair oil has gone a long, long way! I've done three treatments so far and I've still only used up 1/4 of my product if that. 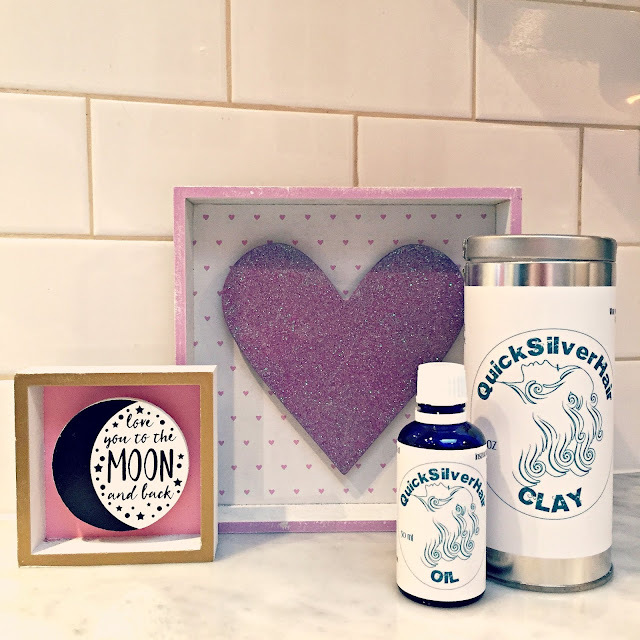 I like the value in what QuickSilver offers, as each tin and bottle last a long time. Joli is well versed in the needs of those with fragrance and chemical allergies, which is important to me and to many others as well. She uses the pure essential oils only. The clay mask is lightly scented and often described as "fresh and clean" with notes of grapefruit, lavender and bergamot. I personally have a difficult time introducing new scents to my own routine and the clay was just fine! To activate the mask, Joli recommends using 7-10 drops of her Hair Oil. This oil has a lovely earthy, fresh smell and again, is made of natural essential oils. There are warm notes of ginger and lavender and a nice nutty scent due to the activating Sweet Almond, Sunflower, Argan and Jojoba oils. It was fantastic with the hot steam of a shower, I felt like I was at a luxurious spa! If you do have very particular scent needs, Joli mentioned that in lieu of her hair oil, you can use a dropper full of your own Argan, Jojoba, or Coconut oil. See the scrumptious packaging below? They came in the mail lovingly sent, and I feel they would make a elegant gift for anyone going gray. I could picture giving the set to any silver sister newbie just on her adventure, or gray hair graduate for her birthday, any holiday or just to say: "You're great!" After the clay and oil, the only other thing that you need to get your mask ready is some silicone-free conditioner of your choice. This is where we come in! 😃 Joli and I found that our By The Way Co. Daily Moisturizing Conditioner worked absolutely wonderfully with the mask and oil! After leaving the mask on for 40 minutes, and in conjunction with our silicone-free conditioner, my hair was left as soft as can be. It was shiny, tangle-free and brightened. What's more, after some fun discussion, for my second mask usage, I did an experiment with our also silicone-free Purple Conditioner. The results - soft and bright. While those with more yellowing or brassy tones than I have might experience more whitening with purple conditioner, I can also say that I had no purple staining of my hair or scalp after leaving the mask + purple conditioner on for 30 minutes. Below is a photo that I took after mixing the QuickSilverHair mask and oil together with our purple conditioner. Doesn't it look delicious!? (DON'T EAT IT!) Joli instructs her customer to mix everything to about a "frosting" consistency, and can I just tell you...... I had the MOST FUN EVER, imagining that I was putting frosting on my hair. I was laughing out loud because it was just so enjoyable. If you decide to us a non-purple conditioner, which is equally great, your mixture will look just as luscious as below, only pure white. Before using your hair mask, it is suggested that you wash your hair with a silicone-free clarifying shampoo. Again, our own BTW Co. Clarifying Shampoo worked great for this. I washed my hair, slathered on the mask (WOO HOO!!!!) and then relaxed for 30 minutes before washing everything out. Joli sends each order with very specific usage instructions, and you can also find the information on her WEBSITE with this perfect infographic. 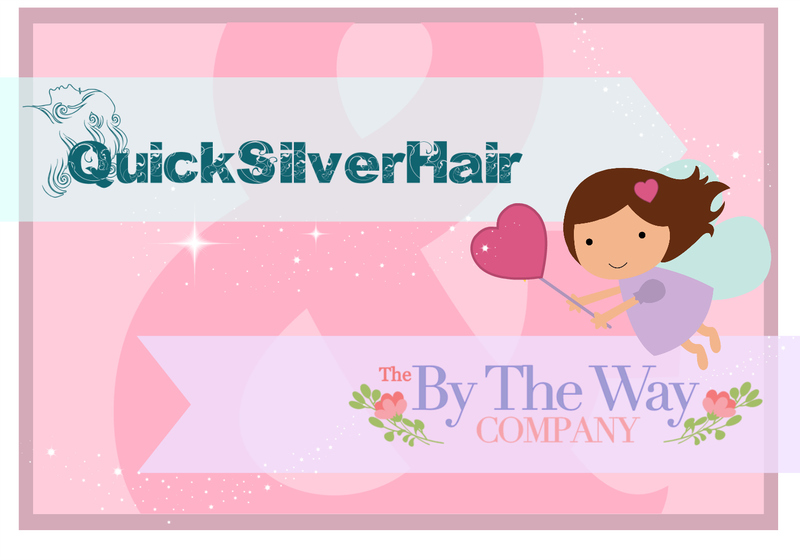 USE THE COUPON CODE BTWHappyHeartsQSH FOR 15% OFF AT BOTH QuickSilverHair AND The BTW CO.* FROM FEBRUARY 7 - FEBRUARY 14! Until next time, love your hair and Happy Valentine's Day!!!! *Don't forget, your can also find BY THE WAY, Your Hair Looks FABULOUS! on Amazon with free Prime shipping! We aren't able to offer the 15% coupon there, but you will receive free shipping if you are a Prime member. There's A Reason We Call it: "Life Changing!" PS! 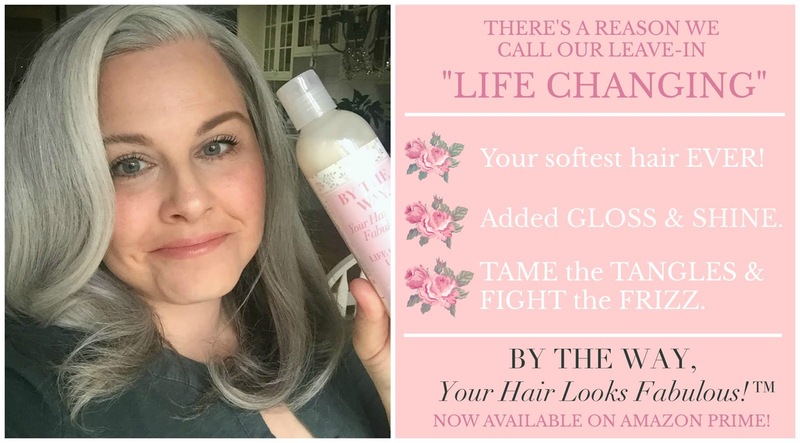 If you'd like to check out our "Life Changing Leave-In" Conditioner you can see it on our site here and on Amazon here. 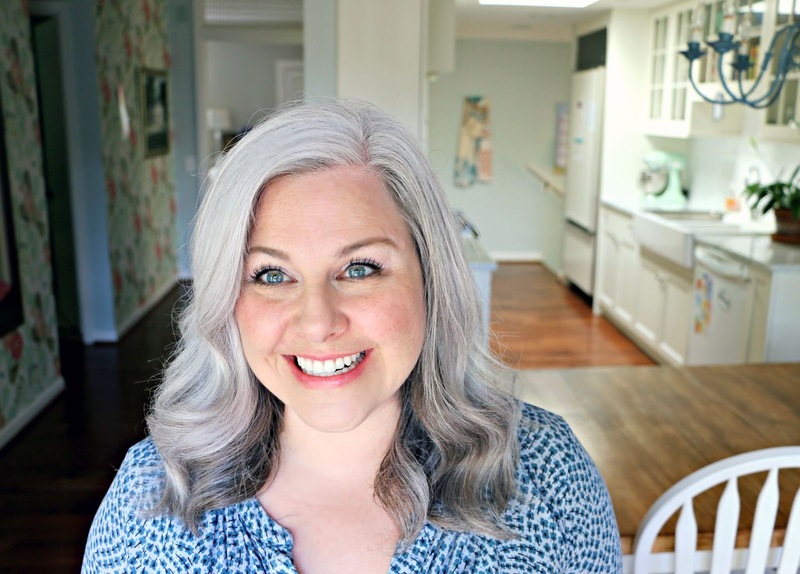 Katie Goes Platinum -A Fellow Blogging Silver Sister to Inspire! I wanted to stop in though, and share the name of a fellow blogger and Silver Sister. Her kindness and and encouragement as we've started our company has been so appreciated. Beyond that though, Katie is inspiring women (myself included!) who are taking the gray journey, through her wonderful blog content. 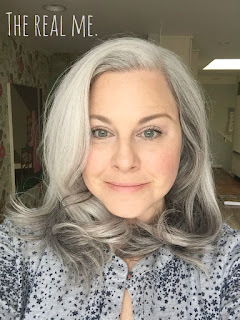 Please visit Katie Goes Platinum for lots and lots of uplifting stories of women transitioning, product reviews and insight into this whole gray hair adventure! Follow along on Instagram and Facebook too. I love watching Katie's grout progress and so will you. Guys, we all know it- gray hair can be a little..........erm......UNRULY. Those silver strands that you're growing out can come in with a WHOLE NEW TEXTURE. They can have a mind of their own! Think beautiful, sparkling new friends who you invite over for a quiet cup of tea and a civilized chat, but instead they decide to go crazy and have a WILD PARTY on the top of your head! To make matters worse, the vast majority of us do not have naturally light blond hair, so those new party-animal friends? Yeah, their antics are EXTRA noticeable when highlighted against your darker, non-white hair. 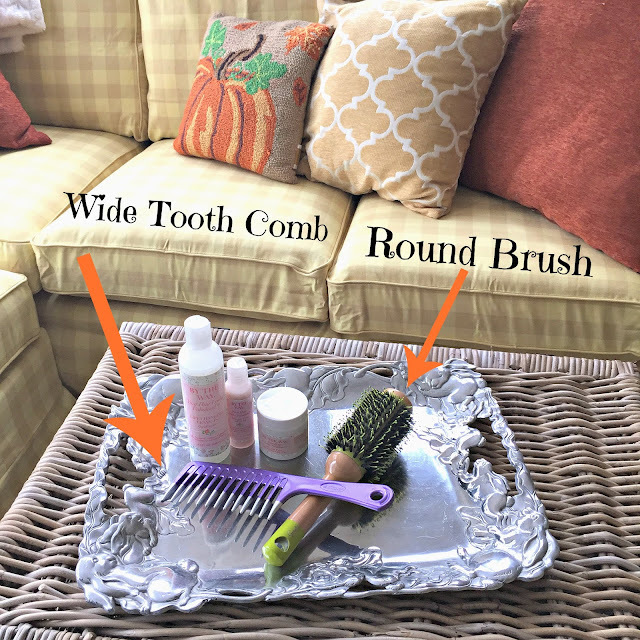 Before I begin, remember: you can have all the right tools like styling products and brushes, but without knowing how to use those tools they're not going to work! Be patient and practice. Give it your best shot and you'll do great! Ok, here we go. Let's pretend that you're starting on a day with freshly washed hair, just out of the shower, STILL DAMP. My suggestion is that you use the purple shampoo and conditioner from our....ehemmm....ONLINE STORE when you need a bit of brightening of your whites. Or our clarifying shampoo when your hair feels a little weighed down from styling product build up. If your hair is good to go, our super moisturizing daily shampoo and conditioner will nourish you hair and help make the texture soft and lovely. No matter what you use, starting with damp, hydrated hair is the first step! So now, this is the part where you want to get yourself something like your fingers, or better yet, a wide-tooth comb like THIS one. When our hair is wet, it is extra prone to breakage and damage so please be super gentle!!! I grab sections of my wet hair and hold it slack while I comb so that I am not pulling my hair out. Use your finger or wide-tooth comb to simply get ride of any big tangles. Next, I take my Life Changing Leave-In Conditioner, give it a shake and pour a generous sized dollop into my hand. As you use this leave-in, you'll get a better idea of how much your particular hair needs. Feel it out, there's no right or wrong amount! The Life Changing Leave-In is one of my favorite things that we've made. It just makes such a difference! My hair always comes out feeling so much softer, manageable and shiny. It also protects and nourishes with moisture. You can gently distribute the leave-in all around your hair using the palms of you hands. Then, I personally follow-up with the wide-tooth comb to help evenly apply it. Next up is a little bit of our Silicone-Free Hair Serum. This is going to give you even more softness and lots of shine! A small amount goes a long way. I start with a dime sized portion in the palm of my hand, rub my hands together and evenly distribute it. Step 3. Here's the Important Part! The Smooth and Smoosh!!! Ok, listen carefully.... so, after experimenting and experimenting, I have FINALLY FOUND SOMETHING THAT WORKS! I've been using this technique and it works every time. I carefully comb my hair and make it as straight/smooth as possible on top. Then I use a cream like our Silicone- Free Styling Cream, or a gel, something like THIS . I smooth a small amount with the palm of my hands, moving from the part in my hair downward. The trick is, is that you are SMOOTHING down the frizz on the top of your hair. You can smooth all the way to your ends, but this is mostly for the wild gray hairs at the top. Now, again, carefully, I gather my hair into a sleek, low ponytail, smoothing my hair down as I go. If your hair is too short for a ponytail, don't worry about this step. After it is in a ponytail, one that is not too tight, but just snug enough to help keep my hair taunt, I then apply one more layer of my cream to the top of my head, making sure to smooth everything down and then I STOP TOUCHING MY HAIR! Step 4. Air Dry a Little or Blow Dry While Smooshing! You're in the home stretch! Ok, so, if you have time to let your hair air dry a little, then this is always good. I often let my hair dry to partially damp when in the ponytail. While this is going on, I check to see if my frizz is still staying down, and if it's not, I simply put a TINY bit of the styling cream in my hair and I smooth the frizz down again. Then I stop touching my hair! This is part of the trick. If you are pressed for time, or if you just want to use your dryer, that's fine too! The concept is the same - smoosh, use gentle tension to keep things smooth, don't mess with your hair too much. When I'm ready to dry, whether it be from the start or after air drying for a while, I turn my dryer onto medium or warm and I angle the air flow down while smoothing the hair on the top of my head with the palm of my hand. It's all about having the air flow and your hand and the product smoothing the hair follicle down. Your hair will look flat on top initially, but once you get everything smoothed, later, you can go back and add volume. Step 5. Bring in the Round Brush! This is the part where I grab my big round brush. You can use any type or size of round brush that you please. Just find something that doesn't pull out your hair. I've found that boar bristle round brushes work well for me. You just need to experiment with your own hair type. Proceded to dry your hair with the round brush while also smoothing with your hand. HERE is a good video tutorial on drying your hair with a round brush! Finally, I feel like the following trick really really helps to smooth and calm my hair. After I'm done drying, I gather my hair back up into a ponytail or twist it into a bun and let it just "set" for a few minutes. I like to let my hair cool down. Ok, this final step is optional, but at least for me, it makes a big big difference. I've found that using heat styling to smooth my hair is a super tool. The thing is, we have to be careful not to use anything too hot, or we'll damage and yellow our white hair! 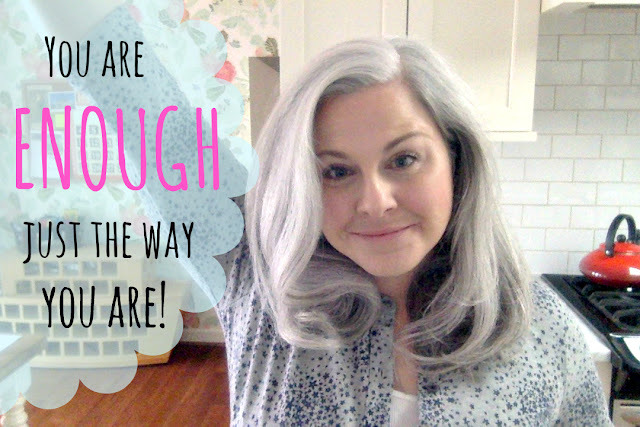 Straightening irons and curling wands are awesome tools, but, even on low settings, we are risking all of that damage to our vulnerable hair. What I do use is large hot rollers. I use THIS set and love them very much! What I like about hot rollers is that they don't seem to be as scorching hot and damaging as straightening irons and curling wands. Also, with my set, if I watch them, I feel like I can unplug the rollers a bit early, hence making them warm but not too too hot. I think that the velvety flocked covering to my particular roller set, helps to not snag or burn my hair. Using the largest diameter rollers that your hair can take, will smooth your hair AND give you great body and bounce! It's a wonderful finish! You can follow up with a tiny dab of serum if needed, but usually I don't, the shine is already there. And there you have it! The Lolo Method! I hope this was helpful in your quest to styling your hair. I know that you might have your own tips, suggestions and routines and I'm always more than happy to hear about yours too! Also, for our very curly girl sisters out there, what do you use and do to get your gorgeous curls looking great? Until Next Time, Enjoy Your Hair Silver Sisters!!! Hello sweet friends! This morning I was trying to take some photos of my hair for our new online shop. I wanted some nice pictures of what our products can do. It seemed simple enough- I planned it all last night as I was falling asleep. I'd wake up, get ready, do my hair and make up extra nice. Take some pictures, runs the errands, then homeschool Noah, take him to his tutors, stop at my Mom's to borrow holiday props for new shop photos, write a blog post, answer the customer service questions, make dinner, pick Noah back up and try to find time to walk on the treadmill. Oh, and water the indoor plants, and get to the grocery store for Thanksgiving prep, and walk the dog, and get my teen to write thank you notes for his birthday gifts. All was going ok this morning, at least through the hair and make up. I went downstairs to attempt to take some reasonably usable photos of the front and back of my hair. When I got there though, I noticed that there were dishes in the sink that needed to be cleaned up, and the droopy plants that required my immediate watering attention. Then, as I was just about to start taking pictures, the dog started barking to go outside (AGAIN!) and I had to stand in the cold, repeating to her over and over: "DON'T YOU DARE DIG IN THAT MUD AGAIN JOSIE!" Josie has had precisely 1,783 baths in the past two weeks, after squirrels dug up our small backyard patch of grass to hide their seeds. She figured out if you dig up the grass, not only can you find the seeds, but that it's fun and you can make HUGE mud piles with all of the dirt and melting snow. We're not thrilled with this new development. Back inside and now running late, I was determined to get at least a few good photos. I held up my phone, tried to find the best lighting in our kitchen, and smiled. A doughy, old, tired me stared back on the screen. My chipmunk cheeks were in full bloom. The hollow, tired looking under-eyes, that I always hoped I would not inherit, were ever so slightly more pronounced than the blog photos of yesteryear. These past four years of homeschooling have been wonderful, but can sort of run you ragged. I used to spend my daytime getting things done, including exercising and primping and making healthy foodie foods and smiling for the blog! 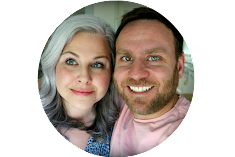 Now my time is split between parenting full-time, homeschooling, running a household and starting a business. This morning, getting those pictures was just so much harder than it was before and I was feeling it. I was acutely aware that I am a 40-something year old woman who is beginning to age and really began to question if I was enough. Enough of everything I needed to be to juggle all of these balls in the air. I was near tears as picture after picture just looked "off." Especially when I went back and compared them to the blog photos that I took just four and five years ago. What has happened to me? I've lost my sparkle. I don't have what it takes to do all of this! I know very well that this is all relative, and that WE ARE OUR OWN WORST CRITICS, but I felt defeated. Instead of beating myself up anymore though, I decided to stop taking pictures for now, maybe I could get better ones later and I really needed to get going on my errands. I hopped into my car, pulled out, and proceeded to almost bump into THE GIANT DUMP TRUCK BLOCKING 2/3 OF THE FOOT OF OUR DRIVEWAY. I got two houses down, when I realized that our street was completely blocked by heavy machinery. I was NOT going on errands right now. By the way, did I ever mention to you that they tore down (except for two walls) a big, old pretty church from the 1920's, directly across the street from our house? Now they're building a four-story office building there. Each morning we wake up to another hairline crack in our ceilings from all or the jackhammering. Which might explain........WHY I'M SLIGHTLY ON EDGE!!!! 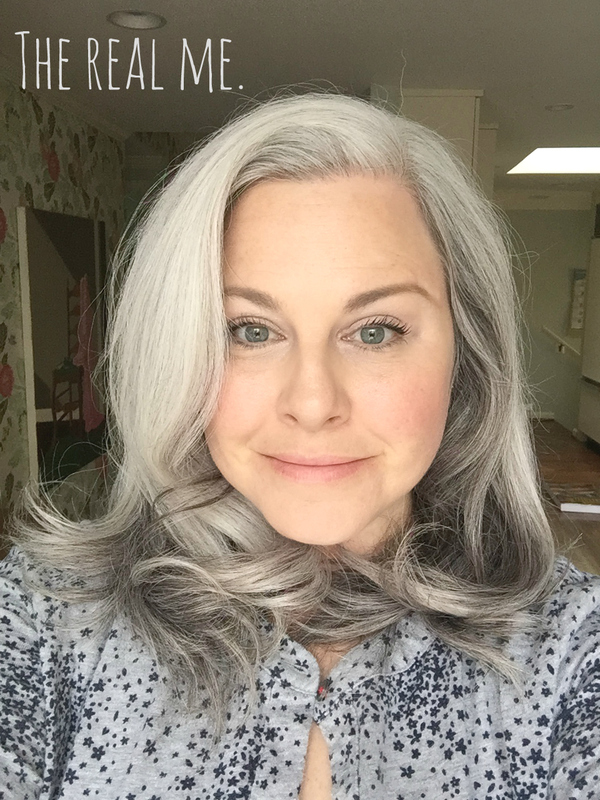 As I was coming back inside, it dawned on me that this is what all of this gray hair thing is about - being the true you, and being ok with it! 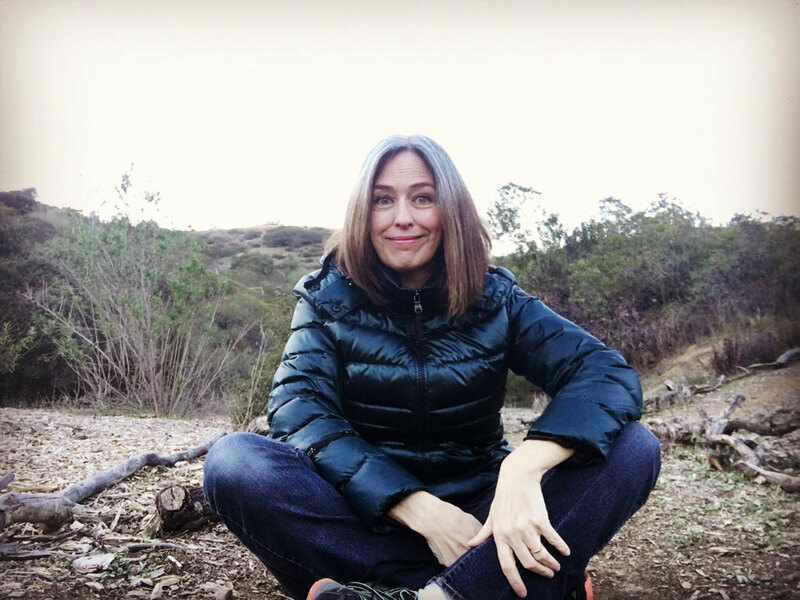 Whether we stop coloring our hair for health reasons, or to get away from the chemicals, to save on time or the cost of dying our hair, it all essentially comes back around to self- acceptance and embracing who we really are. Even more so I realized, this is why we created the By The Way, Your Hair Looks Fabulous! line of products. (I promise you, this blog post is not just an advert.) I wanted hair care that would represent a true reality, not a glossy, Instagram filtered version of a "perfect life. I was frustrated that I couldn't find naturally derived shampoos, conditioners and styling products that I COULD ACTUALLY AFFORD! 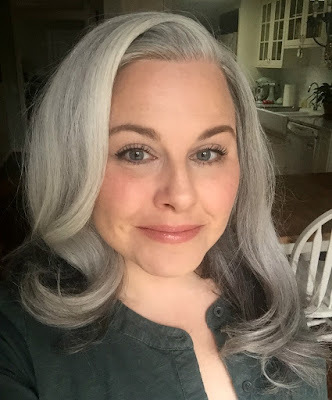 I was bummed that there wasn't a brand on the shelf that totally understood my crazy, gray fly-aways, the texture of my hair and just why my silvers needed help with shine. We've toiled away for years now to create an authentic product to love. I've been spreading the message that the true you is great! 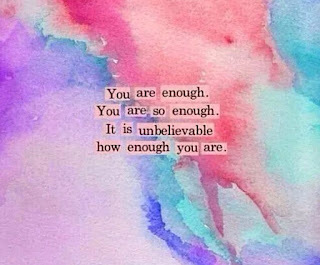 But it hit me today, for some reason, I haven't been valuing my authentic self even closely as much as the products- Chipmunk cheeks, tired eyes, dropping the balls and all. I've forgotten to love myself too! I might have had a momentary freakout this morning. A woe-is-me moment. It's ok though, that's also being human, being real. I know more than anything, that life is BIG and AMAZING and there's much too much to explore rather than to be stuck inside, pining away for perfection. Guess What!? We're SHIPPING!!! \(^-^)/ !!!! Guess what!? We're SHIPPING!!!! \(^-^)/ !!!!!!! 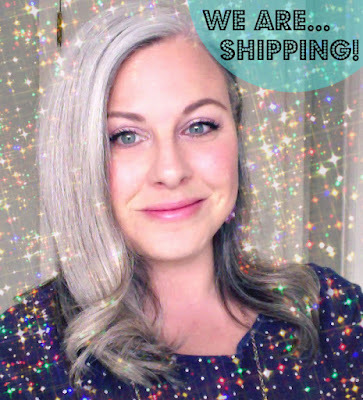 Dear Silver Sisters: I am OVER-THE-MOON to announce that By The Way, Your Hair Looks Fabulous!™ shampoo, conditioner and styling products are now on sale at our new site www.thebtwco.com! I would be really grateful if you would stop by and take a look. You have all been wonderfully supportive as Jon and I have worked to launch the company, and TODAY is the day that you can now help THE MOST by spreading the word about The BTW Co. across social media. Sharing our new site in your Gray Hair groups on Facebook would be especially helpful. Thank you! Having the opportunity to share my story, learn about yours and be a part of our wonderful community of Silver Sisters has been one of the great joys of my life. I am deeply, deeply appreciative that you have been interested in what I have had to say, and that you have shared your journeys with me. I love you Silver Sisters! Welcome to a new adventure where we Shine OUR BEST! Friends! Thank you so so much for your amazing response to my announcement this week. All of your support and encouragement was incredible! I'm thrilled to share our products with you - our new haircare brand, "By the Way, Your Hair Looks Fabulous!™" will be up and running by September 6 at the latest! If you would like to receive updates and be notified as soon as we are ready to launch, we're creating a mailing list NOW! I'd love it if you would please send your name and email address to hello@thebtwco.com to receive information about our new brand. We take privacy seriously and will never give your contact info to a third party. - Leaping Bunny approved and not tested on animals! And, all of this goodness will be available at an affordable price! 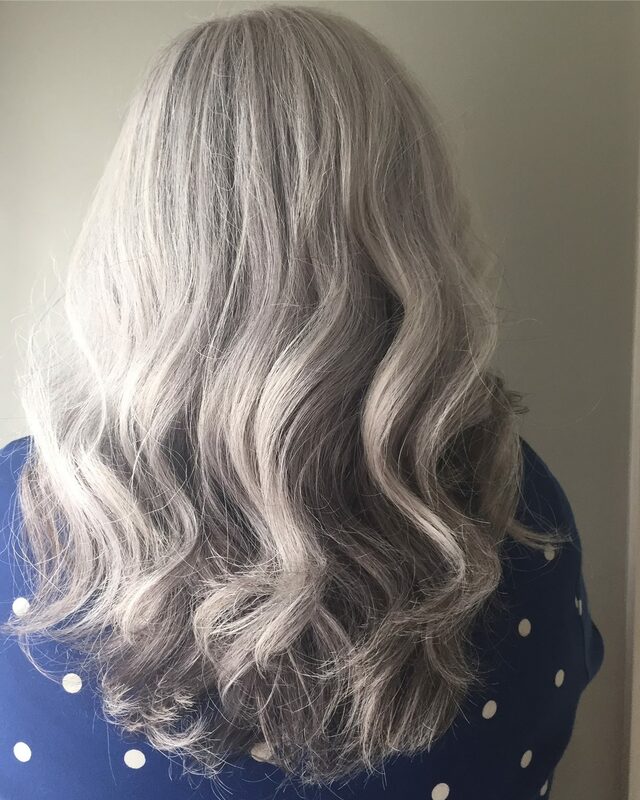 As someone who went gray at a young age and then struggled with the chemicals in most hair dyes, I decided to take the leap almost ten years ago and let my silvers shine. What I've found over the years is that we truly lack natural, safe, affordable products to care for our unique hair needs. That's why we are brining this product line to you. It is our mission to help empower all of my Silver Sisters out there to stand tall and feel their best. To sparkle! *As always I can't thank you enough for helping us to spread the word as we begin this new adventure. Please share with your family and friends, and most of all in gray hair groups on Facebook, as I am not allowed to self-advertise. Thank you! Thank you! THANK YOU Silver Sisters!!! Hi friends! I have some really EXCITING NEWS!!! Today I went to the salon for a much needed trim, and when I came home, posted a picture on my Instagram. Your responses were so kind and I decided it was the perfect time to share little surprise with you! I had quite a few questions asking what kinds of products that I use on my hair and well.............what I've been using IS MY OWN, NEW PRODUCT LINE!!!!! 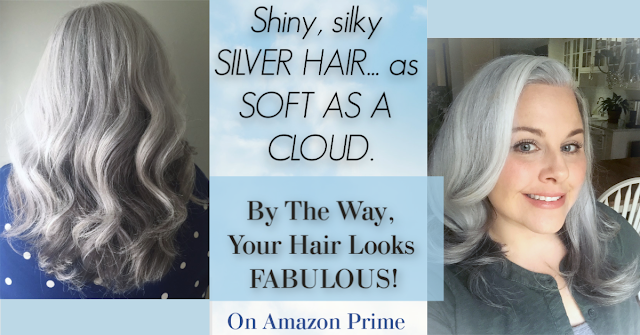 My husband Jon and I have spent a long long time coming up with a line of shampoos, conditioners and styling products specifically for Silver Sisters!!! (Although, six of the eight products can be used on ANY hair color or type.) I saw a need in the market for NATURAL, paraben-free, sulfate-free, silicone-free (etc) products for gray hair that were AFFORDABLE and would leave you with soft, shining, vibrant hair! I am so excited and can't wait to share more with you guys. Our products will be available for order in September. More info to come soon, the moment I have it. If you PLEASE could, it would be a HUGE help to Jon and I if you would spread the word about our upcoming line to any family or friends who might enjoy it, and ESPECIALLY in any Gray hair groups on Facebook or anywhere else on Social Media, as most places you are not able to self-advertise. Thank you, that would help me more than I can say. We poured our heart and soul into these products -from one Silver Sister to another, so we can help make this journey a little brighter. Love you guys! THANK YOU!!!! 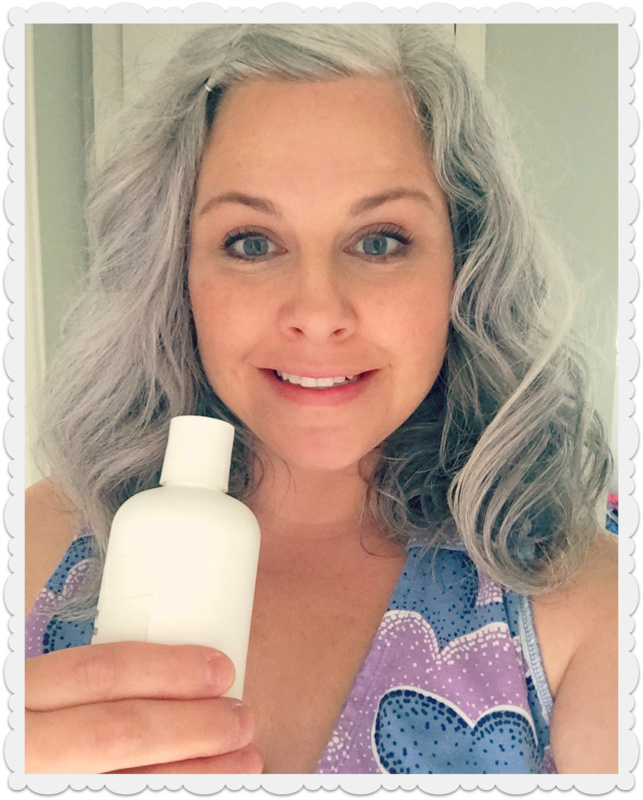 Super Exciting, Hair Product SECRET, and What I Use on My Skin! Ohhhh Silver Sisters, I'm guessing that you might have heard it by now, that today I started making short Instagram Story videos. I've been posting all day long, and I just can't seem to stop. It's so much fun and a lot easier than sitting down to blog. This is all quite embarrassing and awkward honestly, and I feel about two decades too old to be making Instagram videos. I'm throwing my worries out though, it's time that I diversify my tech and find easier ways to share with you. If you're interesting in seeing my short clips, be sure to subscribe to How Bourgeois on Instagram!!! 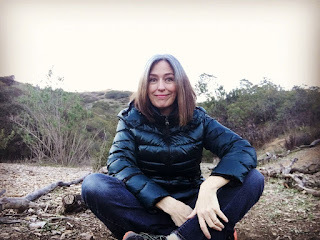 At any rate, two quick things for this post- the first is a super exciting hair product secret that I just can't share in full yet, but hope to soon! The second note is about skin care. A very kind reader asked today if I could share what I use on my skin. I appreciate the interest and I'm flattered that she wanted to know, but I'm always so worried about my skin and would love any product suggestions from you too! The second bit is in response to the question: "What skin care products do you use?" It was very nice to be asked, but I'm not convinced that my routine is even close to a good one. I have wrinkles and crow's feet and the occasional blemish too. None of this is fun and I'm completely open to hearing about products that my readers love and use. Maybe they will help me! For what it is worth, here are the simple products that I use and feel work well! First, I will say that my skin tends to be on the dry side. I'm 41 and struggle with the beginnings of fine lines and wrinkles and sun spots/ freckles in the summer. I had a basal cell skin cancer removed from my forehead a couple of years ago. 😥 It was from years of not wearing sunscreen as a teenager and in my 20's, especially when I would be at the beach on Lake Michigan. I really really really regret it. I'm incredibly thankful that my dermatologist caught the spot, and ever since I've worn mineral sunscreen diligently every single day. Burt's Bees Intense Hydration Day Lotion . I genuinely love this lotion. 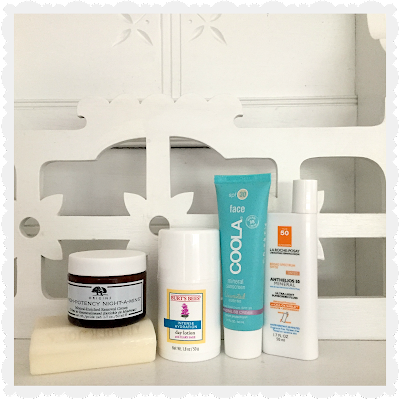 I was looking for something that was inexpensive, yet still natural and would work. It's very hydrating and has helped a lot with my dry skin, and the Clary Sage claims to help with fine lines. I think it has! When I am gifted an Origins Cosmetics giftcard, or able to splurge, I do swear by their Starting Over Age-Erasing Moisturizer. Really, I saw a nice reduction in my wrinkles and would use this moisturizer always if it was more within my budget. Origins has a nice points program though, and as I purchase my concealer and pressed powder from them, I usually rack up enough points to receive something for free each year. Which, leads me to the next product, one that I chose as my freebie! It's the High-Potency Night-A-Mins Mineral Enriched Renewal Cream. I put this on at night as an extra wrinkle cream and an hydration booster. It seems though, that they're only now selling it as a skin refining oil online. It's worth a look! Finally, sun protection. That's my big thing. You know, it's funny because I often forget to put it on my neck and chest and especially in my Insta Stories, the sun damage shows! I need to remember to get it everywhere. La Roche-Posay Anthelios 50 Tinted Mineral Sunscreen . It was recommended to me by a friend and I've heard that many many people like this light-weight mineral sunscreen. It feels a bit tacky going on, but it dries quickly and unlike most mineral sunscreens, it leave no white cast! So there you have it! At least the part about my facial products. I'll be sure to keep you up to date as I find more winners.